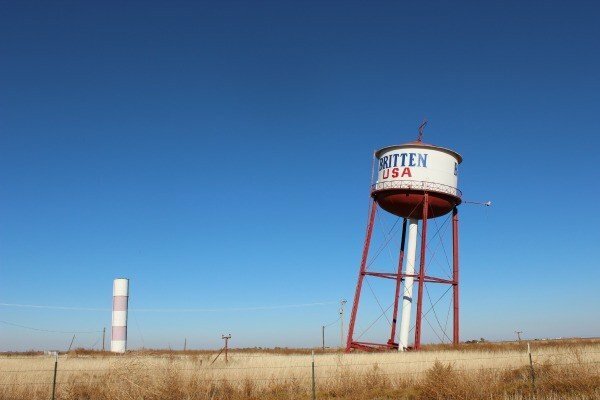 The leaning water tower roadside attraction in Groom, Texas is one of many quirky attractions you’ll see along Route 66. You can’t drive along the flat Texas panhandle heading into Groom, Texas and NOT spot this leaning water tower roadside attraction. Sitting just off the side of I-40 and old Route 66, this structure breaks up the flat scenery and provides a quick fun, photo op. 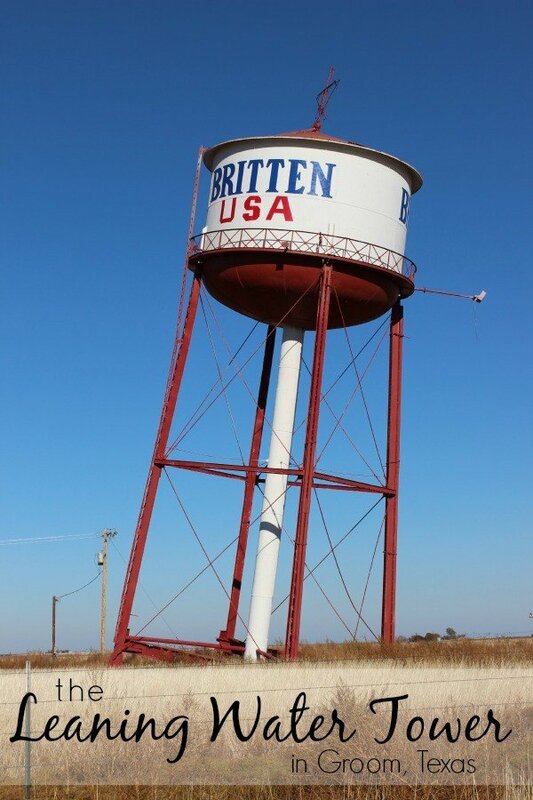 The water tower, labeled “Britten USA” has never been a working tower at this location. According to Wikipedia, the water tower was slated for demolition when it was purchased by Ralph Britten and moved to its current location. In Groom, it served as a sign for Britten’s truck stop and tourist center. The truck stop is no longer open but the water tower remains a popular stop along the highway, if only for those tourists wishing to document their road trip with fun and quirky stops. This is a quick and easy stop along I-40. Follow exit 114 and you’ll find a turn off that runs alongside the water tower so you can pull off the road and snap a picture or two. Minutes away, you’ll find the Giant Cross which was once the largest cross in the world. Both stops are free and a great addition to any road trip Route 66. Do you enjoy stopping at roadside attractions? Here are a few others that you may enjoy. When was the last time you stopped at a roadside attraction? That leaning water tower is a hoot! It looks like it may fall over any minute. hahaha I never knew we had our own leaning tower! 🙂 Yes, we don’t take many road trips right now, but making stops to enjoy the scenery is always nice. I’ve seen that! I have been thinking that one of these days you would post something that I have seen. And here it is. Too funny that it is a leaning water tower. Ha! What a funny thing to see along the road! I love the story behind it–interesting to know that the guy just purchased it to be used as a sign–smart! When I saw the title and the thumbnail on the link-up, I immediately knew that this had “Tonya Prater” written all over it. I’m Texan, and I’ve never heard of either this or the giant cross. If I ever get up to the Panhandle, I’ll have to make a stop. Ha ha, Michele! I must be getting predictable. 🙂 Maybe I’ll mix it up next week. Hmmm..on second thought…maybe not. The Panhandle offered quite a few roadside attractions that you’d enjoy. I wasn’t able to convince my family to stop at all of them. Maybe I need to make a stop back. I LOVE roadside attractions too! I still bug my husband about a Winnie-the-Pooh one he refused to stop for when we drop through Winnipeg years ago. They make road trips fun and this one looks great! We just drove by this last week! Didn’t have time to stop, but I have a blurry photo taken from the car window. Now I can tell my kids about the history behind it. I read about your cross-country trek and figured that you’d gone right past it on the way to Amarillo. What a fun trip! I would love to take a trip on route 66! Too bad this isn’t actually working, that would be even cooler! Pretty cool! I have always wanted to travel along route 66. I heard it’s haunted. Haunted? The entire Route 66? I don’t know about that but it has some awesome stops and roadside attractions. We had a blast, even though we didn’t travel along the entire route. Rt. 66 is a fun drive, especially if you take a driver’s guide for the route with you. I never knew the history though, behind that water tower. I just thought it looked a little scary, leaning the way it does. Oh my gosh. If I saw that off the highway, I’d be freaking out thinking it was falling over! I so wish I wasn’t so far away from everything living in South Florida. It takes so long just to get out of our state. I really need to plan a road trip to leave FL and visit lots of cool roadside attractions. Damn it, now I have to drive to TX. My boyfriend LOVES visiting roadside attractions. We’re planning a trip to Wyoming this summer just to see a giant Jackalope. I’m thinking we need some weekend trips along Route 66 this summer, so we can go explore all the little nooks and crannies in Oklahoma, maybe even Texas. Great photos, Tonya.